Diavolo founded in 1992 and based in Los Angeles, CA, uses architecture, music, surrealistic set designs, and life experiences and emotions to inspire its dance creations. Artistic Director Jacques Heim draws inspiration from not only dance but also architecture and music. Nowhere are these diverse sources of inspiration more evident than in L’Espace du Temps (Space of Time), the trilogy of recently completed works commissioned by the Los Angeles Philharmonic (LAP) along with Movimentos 2014, University of Notre Dame’s DeBartolo Performing Arts Center, Syracuse University, and the Krannert Center for the Performing Arts as co-commissioners. For the first two installments in the trilogy—Foreign Bodies (2007) and Fearful Symmetries (2010)—Heim’s original inspiration came from a cube. René Descartes, the French mathematician and philosopher, believed that the universe was born from geometric components. Foreign Bodies starts and ends as a cube, as does the cycle of life. 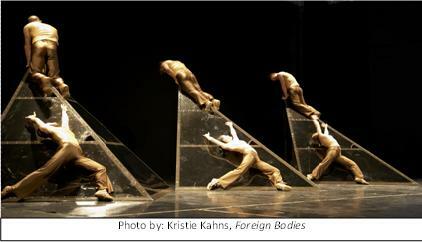 Fearful Symmetries starts as a cube and ends on a clear stage with the dancers looking into the future. 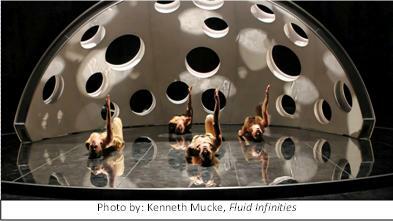 Fluid Infinities (2013), the final installment in this trilogy, represents the future they are looking into. The structure that Diavolo created for Fluid Infinities is a quarter sphere. A single piece of curving fiberglass with an organic pattern of circular openings across the face, evoking imagery of the craters of Mars, a honeycomb of bees, an abstract eye, a shifting brain, or an undiscovered starship. Because the trilogy was commissioned by the LAP, the seven year project has been an unprecedented opportunity for Diavolo to involve music in the artistic process from the beginning. The architectural concepts themselves have become inextricably tied to themes from the music. Foreign Bodies was set to the music of Esa-Pekka Salonen; Fearful Symmetries was set to the music of John Adams; and Fluid Infinities is set to the music of Philip Glass’ Symphony No. 3. To infuse the ideas of these great composers into Diavolo’s work, Heim, Music Director and Dramaturg Bruno Louchouarn, and the entire creative team begin their creation process with intensive study of the musical ideas. For this particular piece, before rehearsals began, Heim assigned “homework” to the dancers to develop movement phrases based on certain concepts from the music. LAP artistic staff regularly attended rehearsals, often bringing the composers and conductors to offer feedback. What makes Diavolo’s aesthetic unique? Diavolo is an architectural movement company that uses abstract and recognized structures to explore the relationship between the danger of our environment and the fragility of the human body. Diavolo creates pieces collaboratively. Company members are dancers, gymnasts, actors, athletes, and above all, teammates. Therefore, the Diavolo aesthetic is a fusion of many different movement vocabularies such as everyday movement, ballet, contemporary, acrobatics, gymnastics, martial arts, and hip hop. What Diavolo does on stage is like a live (moving) abstract painting. There is no narrative, but strong themes pervade the work such as human struggle, fear, danger, survival, chaos, order, deconstruction, reconstruction, destiny, destination, faith, and love.